If you were to glance at the Instagram page for James Franco's The Disaster Artist, you would think it's another polished Judd Apatow comedy (who also appears in the film, in addition to Apatow-regular Seth Rogen). If you were to watch the trailer for The Disaster Artist, it looks like the latest art project in Franco's prolific filmography as a director. If you were to read media coverage of The Disaster Artist, some film writers and pundits would like you to believe that this is an actual dark horse for the Oscars. Now that it's been some time since I've seen the film, and have mulled over what the hell it categorically is, I can tell you that none of the above descriptions accurately paints the picture. It's a strange film, with some seriously cynical and unnerving undercurrents, starring some of the most likable and good-looking movie stars currently working. I don't know if it's going to achieve the affectionate success that its source material already has. Franco stars as Tommy Wiseau, the real life midnight movie mascot who financed, wrote, directed and starred in the (supposedly) so-bad-it's-good 2003 independent drama The Room. Franco's brother Dave Franco plays Wiseau's best friend and acting collaborator Greg Sestero. Sestero starred opposite Wiseau in The Room and it's their story behind the camera that shapes the narrative arc of The Disaster Artist. When Disaster Artist starts out, the appeal is promising. We see the talking heads of several recognizable industry figures express their admiration and fandom for The Room. The next scene cuts to Wiseau and Sestero meeting each other at an acting class. They strike a fast friendship and are soon driving to Los Angeles, California to chase their dreams of becoming famous actors. These early scenes are light and disarmingly funny, mostly because we're still trying to process Wiseau's screen presence. Wiseau's a unique individual, with an eastern European accent and a distinct set of mannerisms. He's also off-putting and passively controlling. His long black hair sometimes cloaks his face and he hides behind his black sunglasses as if he was a vampire with a fresh hangover. Franco's performance is somewhere between inspired and projecting the physical awkwardness that Vincent D'Onofrio gave his alien-inhabited farmer Edgar in Men In Black. Dave Franco on the other hand does his best with a fake beard. The main act of the film involves the making of The Room. Wiseau has an apparent "bottomless pit" of money in the bank to make his passion project and the film crew eventually gets past their reservations (at first) once they realize that their paychecks aren't bouncing. Normally, movies that are about the making of movies are fascinating and fun. 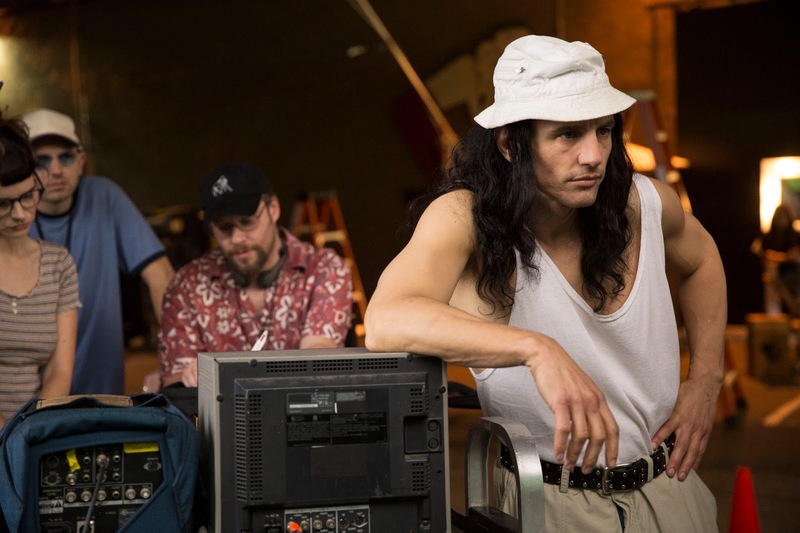 As The Disaster Artist went on, the fascination turned into a quiet frustration and I began to wonder what the overall goal was that Franco and his filmmaking team were trying to make. Wiseau reveals himself to be inept and not very likable. The film's climax involves the first public screening of The Room where the disastrous and embarrassing chuckles from the audience morph into a triumphant rendition of Mystery Science 3000, jubilantly encouraging jesting from the audience. I myself never attended a midnight screening of The Room, so maybe I missed the big inside joke that The Disaster Artist is emptying the tank on. However, the video essayist in me did respond strongly (and positively) to the final section of The Disaster Artist that put clips of The Room and this film's recreations side by side with each other. There's something powerful about watching the filmmaking team's impressive task of mimicking Wiseau's moving images. They begin to overlap and speak to each other. In this specific case, it's the ultimate compliment of filmmaking and homage. I would've rather watched two hours of that. Maybe I might've really learned something about Tommy Wiseau and, more importantly, would've come a little closer to understanding the phenomenon he has created. I haven't seen The Disaster Artist yet, but I have seen the clips circulating online where the mash-up of real and re-enactment are merged into one. This juxtaposition is such a classic video essay move. I specifically set out to do the exact same thing, only to find somebody beat me to it. Now from reading your article, this seems like a notable example of a feature film aping the characteristics of a video essay; usually it's vice versa. This obsession with form, reproduction over expression seems to be coming to a grinding halt. It's no longer enough to simply juxtapose imagery to arrive at a new truth. I remember when I was getting my MFA, James Franco was doing the same (at a different university). Photographing a photograph and taking credit for being the one to place the aura in a new context seems too easy a way to participate in the marketplace of ideas. It says more about Franco than Wiseau. I've long thought the video essays i've made place me in nebulous territory between fan and filmmaker. I shouldn't say more without seeing The Disaster Artist, but it looks like a comedy that might actually raise some thought-provoking questions about what constitutes an homage and what is valuable about reproduction of existing works.